The infusion of iodinated contrast materials as an aid to a variety of imaging studies is associated with the development of acute renal failure (now typically called acute kidney injury). This nephropathy almost always occurs in predisposed patients. Risk factors include pre-existing kidney disease, advanced age (>75), diabetic nephropathy, and congestive heart failure. The common thread running through these conditions is renal underperfusion. It is close to impossible to cause ARF in subjects with normally perfused kidneys. A number of strategies have been employed to prevent contrast nephropathy. These include intravenous saline infusion, IV sodium bicarbonate infusion, and the administration of oral acetylcysteine. Developed as a treatment of acetaminophen overdose, acetylcysteine has been widely administered over the past quarter of a century as a preventative against contrast nephropathy, despite no persuasive evidence that it works. The same disclaimer applies to sodium bicarbonate infusion. Weisbord and a division of collaborators decided to test the efficacy of both acetylcysteine and sodium bicarbonate in the prevention of this syndrome in a sufficiently powered study that would allow a firm conclusion as to the effectiveness of the two interventions in question. Their patient population was at high-risk for renal injury secondary to contrast infusion. They were virtually all male as this was a VA study. The results were reported in the New England Journal of Medicine last week – Outcomes after Angiography with Sodium Bicarbonate and Acetylcysteine. The short message is that neither of the two interventions was superior to saline infusion alone. The table below depicts the study’s central points. Click on it for a larger and more readable version. This finding is of great interest by itself, ie don’t bother with acetylcysteine or sodium bicarbonate as preventatives against the development of contrast nephropathy. But the study raises another question that is not addressed in the paper or in the editorial that accompanied it. If each drug was no different from saline infusion alone, does saline itself work? Here a little analysis is required. Why should saline work? The rationale for saline infusion is that by expanding effective arterial blood volume renal perfusion would increase thus mitigating against the onset of renal injury. But we have a Catch-22 here. Patients who are predisposed to this syndrome are those least likely to increase EABV after saline infusion. The classic example of this phenomenon is the patient with congestive heart failure. Saline infusion to these patients just results in salt retention without any increase in renal perfusion. Thus, the administration of IV saline is not likely to have the desired effect on renal perfusion and accordingly not to minimize the injury it was intended to prevent. 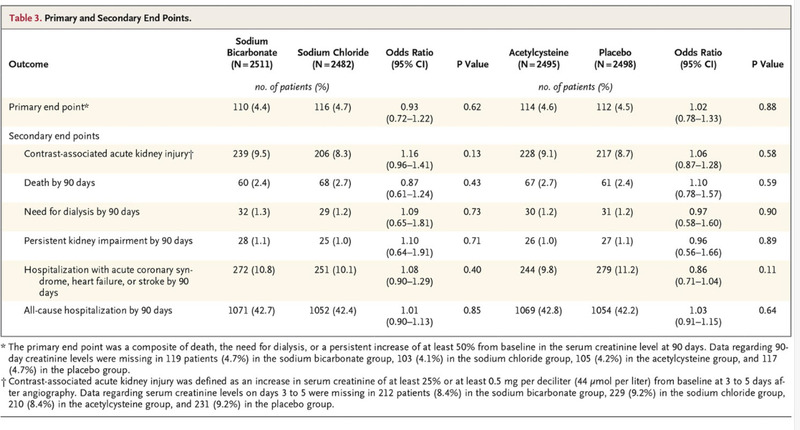 A liter, or thereabouts, of saline administered over a 12 hour period is not likely to cause much harm, but it also unlikely to do much to renal blood flow in high risk patients. The rationale for its use can be found here. As is true of so much that we do, we can’t be sure that saline infusion works in this syndrome. I strongly doubt that anyone would do the controlled study necessary to establish its efficacy as investigators and human investigation committees would likely feel that it was poor practice to withhold fluid from high risk patients about to receive iodinated contrast dye. There is a study underway that plans to evaluate one form of saline against another. If that study shows no difference between the two salt solutions, then we’ll still be left to wonder if either really has any effect. The best practice is to do as few imaging studies, such as coronary angiography, as possible in patients at high risk for acute kidney injury. Many of these studies are done with poor indications for their use. Patients at high risk can often be fully evaluated using techniques that carry less risk. The ARF that occurs in these patients often results in significant morbidity and permanent kidney damage. The full text of Weisbord et al’s paper is below.